← Cousins Maine Lobster Truck Debut in Raleigh This Weekend! Now that spring is here I wanted to share with you about a magical place I came across hidden in Chapel Hill last year. 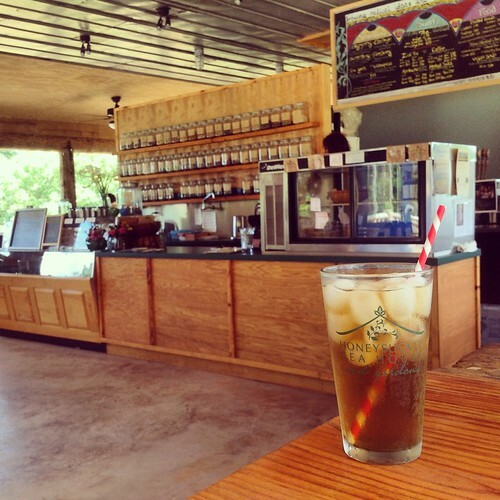 The Honeysuckle Tea House is one of those hidden gems in the Triangle I think everyone needs to visit. It’s like no other tea house I have ever come across. 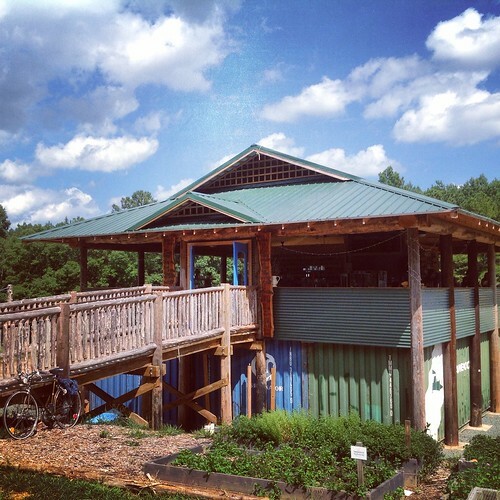 The tea house is a large open air wood frame structure situated on top of four shipping containers tucked away in rural Chapel Hill. 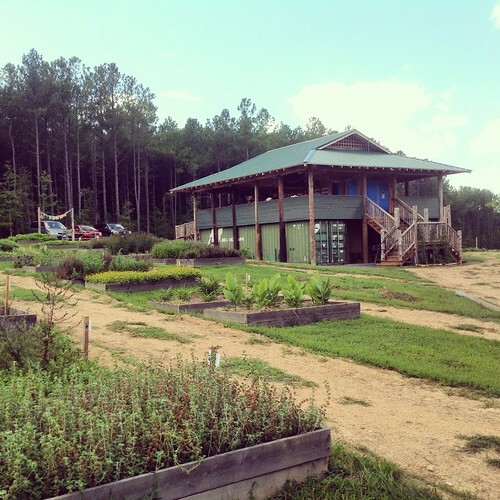 It has a great tranquil vibe and is surrounded by several acres of land with 72 raised cedar herb-beds, a green house and and a six acre berry and Camellia farm. 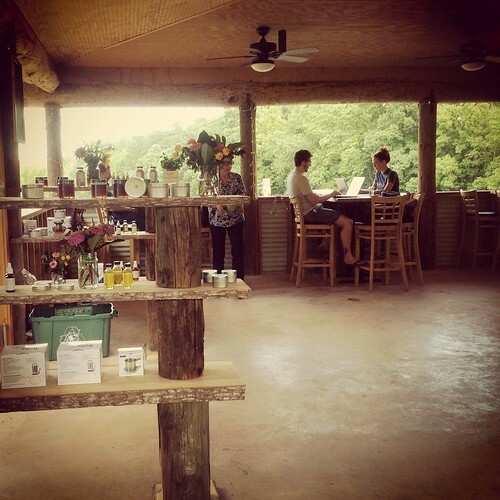 The primary aim of Honeysuckle Tea House is to share with the community the idea of “food as medicine” by serving certified herbal teas, locally roasted Carrboro Coffee, Tinctures, and Honeys, and other local products made on site. In addition to the healthy foods and herbal remedies the tea house hosts numerous Wellness Workshops and serves the community by hosting local musicians weekly with performances every Friday & Saturday evening, 7pm-9pm, and each Sunday afternoon, 2PM-4PM on their outdoor cedar stage (or inside the tea house if it rains). You can view the upcoming music schedule here. The open air seating area is a relaxing place to enjoy drink or have lunch while taking in the peaceful surroundings. Food wise the menu includes wraps, garden salads and pastries (including some gluten free options). On the day I visited my wife and I shared a gluten free muffin and each had a glass of incredible jasmine herbal iced tea. It was so relaxing sitting up above the gardens and gazing out of the tea house at the blue sky as we slowly sipped away on our cool drinks. I actually felt like I was vacationing at an island oasis half a world away from the hustle and bustle of Raleigh. A return visit to this teahouse is high on my list of things to do this week now that the weather is perfect for enjoying the outdoors. It makes for a fun afternoon trip from Raleigh if you are looking for a getaway or just want to try something new. The tea house is only open during the warmer months of the year and closes each winter for the season so don’t miss your chance to check it out this spring & summer. It is currently open daily Sun-Thur 9am-9pm and Fri & Sat 9am-10pm. For directions and more information about the teas and other products they offer visit their website http://www.honeysuckleteahouse.com/. Thanks for telling me about your blog. I will definitely check it out. Thanks!